The zip on my very very favourite pair of winter boots broke this week. It was devastating, partly because I had to walk round with one cold foot for a day and partly because no other boot in the shops would be as good. These boots are perfect. So yesterday, when ‘in town’ I made another attempt at solving my cold foot challenge. The two shoe menders at Charing Cross Station were closed for lunch. In my frustration I remembered someone telling me about how good Timpson were, so I looked on my phone to see if there was a shop nearby. I wish companies would think about how people are accessing their websites now. Stood in the cold waiting for the data to download and then trying to navigate reams of information on a little screen just to find a list of stores isn’t a great experience. Anyway, I found a Timpson, I called them to find out exactly where they were and spoke to a friendly guy who gave me directions. Ten minutes later when I arrived he greeted me with a big smile and remembered the phone call. Steve the Manager and I chatted about the devastation of boots breaking. To be fair I’m not sure he really felt the pain, but he made a valiant attempt which I appreciated. We also discussed the weather; we are British that’s what we do. He explained the process to mend the boot, and why it would take 2 weeks and that he would call me personally if there was any problems. On the counter I spotted this. Timpsons campaign for better service. The first question; Have we amazed you? Actually you did, because your service was good, partly emphasised because most places give decidedly less than amazing service, plus you were actually open when I needed you. £250 incentive; this is interesting. I don’t give feedback to be put in a prize draw. That’s not an incentive for me. I’m writing this and sending off my postcard because Steve did a great job and should be recognised for that. We know that personal recommendations are key to making purchasing decisions so the ‘would you recommend a friend /colleague?’ question is a good one. I think there was a couple of things missing; perhaps seeking to learn if anything didn’t amaze and suggestions for improvement. The branch number wasn’t filled in, so if I don’t write which branch amazed me how will Timpson be able to feed back to that amazing branch? I’m impressed that there was a feedback card in the first place. It’s amazing how many customer-facing businesses don’t actively seek feedback from the people who are the key to their business success. I was talking to a friend recently about how he felt about seeking 360 feedback from clients, which he does at the end of every piece of work. He felt apprehensive. Especially as part of his service was to give feedback to fundraisers on their work, he felt concerned that an invite for feedback could be ‘pay back time’. I don’t actually think that is the case, but understand his apprehension. So it can feel a bit scary, but if you don’t seek feedback, how will you know the amazing things you are doing that you could do more of? And as importantly, how will you know where to make improvements? When you are giving feedback, do consider the impact it will have. Always tell people when they have done a good job, and always tell people when they haven’t, but take care to be constructive and thoughtful. Telling someone they are rubbish with no explanation isn’t ok. It’s just plain mean. So get over the fear and make giving feedback and seeking feedback from customers, clients, donors or colleagues a habit. Without feedback it’s hard to become amazing at what you do. And you all deserve to be amazing. Right? This entry was posted in customer service, insight, marketing and tagged boots, business, complaints, customer service, customers, feedback, fundraising, recommendations, relationships, Timpsons, website. Bookmark the permalink. Hi Lucy, thanks for the lovely story and the incisive observations as always. I do agree with you about customer-facing businesses and their attempts to stay in touch with the client’s needs. Just a few problems though. Things are changing so fast in communications technology that I feel it is unrealistic (and unfair) to expect some of the older traditional type businesses to keep up with all that’s happening (at least the people running them would probably be tradesmen or artisans). These kinds of skilled artisans are threatened by two developments: the advent of the throw-away consumer society (new is good, old/repaired is bad unless it’s the current fad in which case we just fake the old or repaired look – and then just throw it away anyway). So this is driving the likes of cobblers out of business. At the same time they’re expected to learn how to use technology that is literally changing weekly. I’m a comms professional and am finding it hard to keep up! Every time I do a Web 2 or such like course, by the end of the course I find I’m back to square one because the next big thing has come along so I have to go off and learn that. Even emailing and other previously simple tools are becoming complex. Take my twitter account. I’ve been really busy on an away trip for a week and signed into my account today. Unrecognisable! Dunno where to find anything! All change again. Ho hum. Not only are we consuming too much but we are being consumed by constant, relentless and energy draining change. Slaves to the rythm of change, is that what we want to be? Well in my view we already are and it makes me feel uncomfortable. So, back to your cobbler, who’s desperately trying to do his best. I say hats off and the best of British to him because goodness knows if it’s tough for me, it must surely not be easy for him. Let’s hope he doesn’t get consumed – either by the consumer society or the constantly changing communications landscape – and stays in business. He surely deserves to. Thank you for your comments; Agree the pace of change is fast, but the principle of asking for feedback remains the same – whether its face to face or using technology. The value of personal recommendations is huge, especially for small traditional businesses. 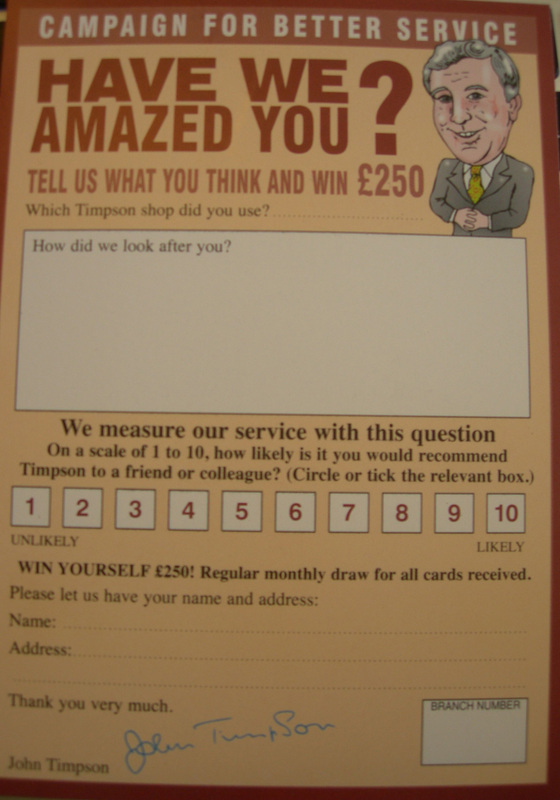 Timpsons is a fairly large chain who are doing a good job at collecting feedback and I agree they absolutely do deserve to stay in business. thanks for your feedback Lucy. As an afterthought, I ask myself what will happen to the know-how of traditional arts and crafts, to those who are not able to grasp, never mind keep up with the changes hurtling at them? Might be a good idea for a charity non? To give them the support they need so that their craft survives beyond the history kindles? A good idea – I agree! I’ve never seen it- have you? I’m thinking – I don’t think I have seen a specific ask for feedback on an Annual Report…… I shall keep a look out from now on. Has anyone else done this or seen examples?